What is Atari game Breakout? Do you like simple games that are easy to play? Do you like games which have simple design? If your answer is yes, Atari breakout is your best choice. 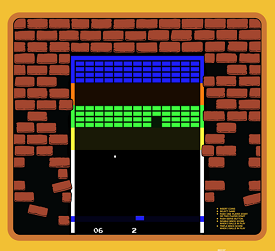 Atari breakout is a very simple game developed by Atari Inc. Atari Inc. was an American video game and home computer company founded in 1972 by Nolan Bushnell and Ted Dabney. Primarily responsible for the formation of the video arcade and modern video game industries, the company was closed and its assets split in 1984 as a direct result of the North American video game crash of 1983. Atari breakout is very easy to play. In the game, you play with a red ball and a paddle. Your mission is to make the ball fly and touch the blocks in the above of the paddle. There are many colorful blocks in specific order above your paddle. You have to click space bar to let the red ball fly. The red ball flies and touches the blocks above. When a block is touched, it will fall off to the bottom of the screen. The ball bounces around your screen and falls too. When it falls down, you have to use the paddle to catch the red ball so that it does not touch the bottom of the screen. If the red ball touches the bottom of the screen, you will lose a life. You have only three lives for each time you play this game. Therefore, you must always be attentive and mustn’t let your ball touch the bottom of the screen. For each block the red ball touches, you will receive points. The game counts the points you have score to claim your record. If the ball touches the stable blocks, you score a little. 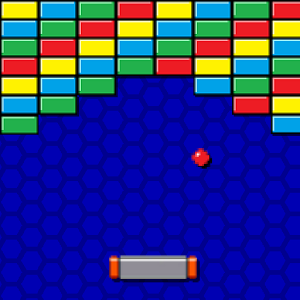 In contrast, if the ball touches the falling blocks, you will score a lot of points. Therefore, try your best to make the red ball touch the falling blocks. 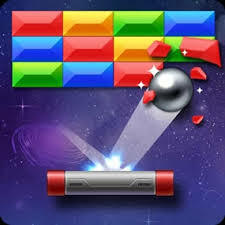 However, if the ball touches the falling blocks, the falling blocks will explode and make the ball’s flying way change, which makes it harder to catch the ball when it falls. You have only three turn to play in each time you play, while the game has so many levels. Therefore, you have to try very hard to pass through so many levels of the game. It is easy to play this game, but it is not easy to win this game. Play Atari Breakout - From ataribreakout.org. Using a single ball and the aim is to gain as many points as possible by control the ball against the bricks.